Even though the Constraint Satisfaction Problem (CSP) is NP-complete, many tractable classes of CSP instances have been identified. After discussing different forms and uses of tractability, we describe some landmark tractable classes and survey recent theoretical results. Although we concentrate on the classical CSP, we also cover its important extensions to infinite domains and optimisation, as well as #CSP and QCSP. Supported by ANR Project ANR-10-BLAN-0210 and EPSRC grant EP/L021226/1. Bulatov, A.A. (2014). Conservative constraint satisfaction re-revisited. preprint arXiv:1408.3690. Gaspers, S., Misra, N., Ordyniak, S., Szeider, S., & Zivny, S. (2014). Backdoors into heterogeneous classes of SAT and CSP. In C.E. Brodley, & P. Stone (Eds. ), Proceedings of the Twenty-Eighth AAAI Conference on Artificial Intelligence, July 27 -31, 2014, Québec City, Québec, Canada (pp. 2652–2658). AAAI Press. http://www.aaai.org/Library/AAAI/aaai14contents.php. Kazda, A. (2011). CSP for binary conservative relational structures. preprint arXiv:1112.1099. Kolmogorov, V., Krokhin, A., & Rolinek, M. (2015). The complexity of general-valued CSPs. arXiv preprint arXiv:1502.07327. Larose, B., Loten, C., & Tardif, C. (2007). 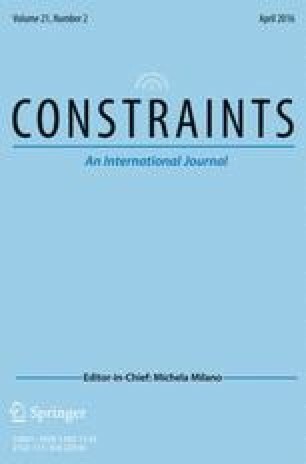 A characterisation of first-order constraint satisfaction problems. preprint arXiv:0707.2562.